What is Te Mātāuru ki Te Reo Tukutuku? Why is this Te Reo Tukutuku investment plan important? It is important because all completed applications submitted for the Te Reo Tukutuku Investment Round will be assessed against this plan. Only a Registered Provider (Individual or Organisation) can register then make an application while the round is open. For more information on registering and applying visit investments. Who are the members of Te Pae Motuhake? How was the Te Reo Tukutuku Investment Plan developed? The plan aligns to the Maihi Māori Strategy with an overall vision to restore te reo Māori as a nurturing first language in homes and communities. Te Pae Motuhake mō Te Reo Tukutuku is responsible for the plan alongside Te Mātāwai. And all Māori language stakeholders within Te Reo Tukutuku have a direct interest in the implementation of the investment plan. What is the vision for Te Mātāuru ki Te Reo Tukutuku? "He tūmatakahuki, he reo tukutuku!" Tūmatakahuki is a stitch used solely in the construction of tukutuku, binding both vertical and horizontal slats together. The vision statement uses this as a metaphor for te reo me ōna tikanga - the stitch that binds and connects all four sectors of te Kāhui ā-reo tukutuku and the stitch woven across generations thus ensuring its sustainability. What are the principles for Te Mātāuru ki Te Reo Tukutuku? The investment plan is founded upon the mātāpono of Te Mātāwai. ‍The Pae Motuhake considered these principles to be the best foundation for Te Reo Tukutuku because of the alignment to the cluster’s national identity, additionally of the eight kāhui, Te Reo Tukutuku is the one closely associated to the Maihi Karauna, therefore the principle Kia raka te mauī, kia raka te katau - the Crown and Māori work together towards a shared vision, will inform Pae Motuhake investment decisions. What are the Te Reo Tukutuku investment priorities? 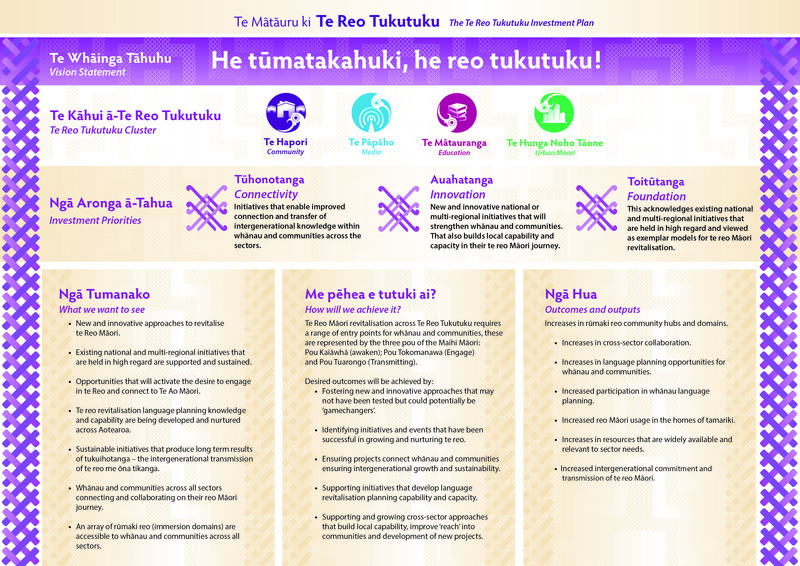 Tūhonotanga/Connectivity: this acknowledges initiatives that enable improved connection and transfer of intergenerational knowledge within whānau and communities across the sectors: Te Mātauranga; Te Pāpāho; Te Hapori and Te Hunga Noho Tāone. Auahatanga/Innovation: this acknowledges new and innovative national or multi-regional initiatives that will strengthen whānau and communities and that build local capability and capacity in their te reo Māori journey. Toitūtanga/Foundation: this acknowledges existing national and multi-regional initiatives that are held in high regard and viewed as exemplar models for te reo Māori revitalisation. What are the objectives? What do we want to see? • New and innovative approaches to revitalise te Reo Māori. • Existing national and multi-regional initiatives that are held in high regard are supported and sustained. • Opportunities that will activate the desire to engage in te Reo and connect to Te Ao Māori. • Te reo revitalisation language planning knowledge and capability are being developed and nurtured across Aotearoa. • Sustainable initiatives that produce long term results of tukuihotanga – the intergenerational transmission of te reo me ōna tikanga. • Whānau and communities across all sectors connecting and collaborating on their reo Māori journey. Mē pēhea e tutuki ai? How will we achieve the objectives? Te Reo Māori revitalisation across Te Reo Tukutuku requires a range of entry points for whānau and communities, these are represented by the three pou of the Maihi Māori: Pou Kaiāwhā (awaken); Pou Tokomanawa (Engage) and Pou Tuarongo (Transmitting). • Fostering new and innovative approaches that may not have been tested but could potentially be ‘gamechangers’. • Identifying initiatives and events that have been successful in growing and nurturing te reo. • Ensuring projects connect whānau and communities ensuring intergenerational growth and sustainability. • Supporting initiatives that develop language revitalisation planning capability and capacity. • Supporting and growing cross-sector approaches that build local capability, improve ‘reach’ into communities and development of new projects. • Increases in rūmaki reo community hubs and domains. • Increases in cross-sector collaboration. • Increases in language planning opportunities for whānau and communities. • Increased participation in whānau language planning. • Increased reo Māori usage in the homes of tamariki. • Increases in resources that are widely available and relevant to sector needs. • Increased intergenerational commitment and transmission of te reo Māori.